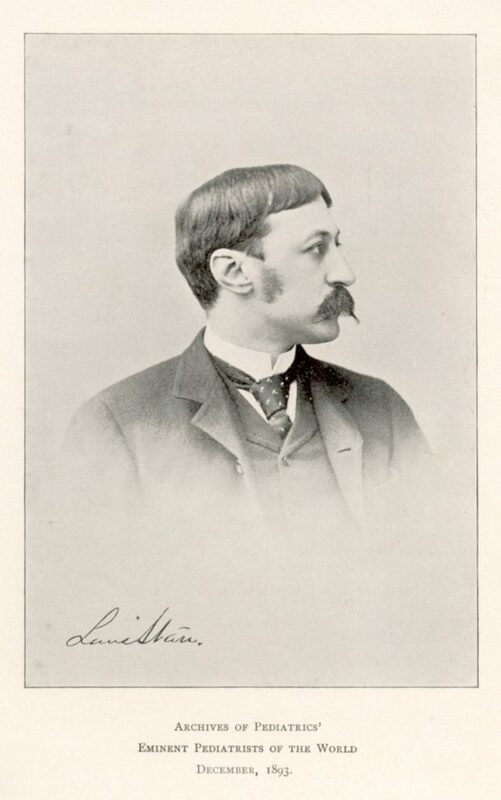 Louis Starr was born on April 25, 1849, in Philadelphia, the son of Isaac Starr and Lydia Ducoing. He attended public schools before earning the degree of Bachelor of Arts from Haverford College with the Class of 1868. After Haverford, Starr enrolled at the Medical School of the University of Pennsylvania, earning his M.D. in 1871. Following his graduation from Penn’s Medical School, Starr interned at Episcopal Hospital in Philadelphia until March 1873 when he was named assistant physician at the Hospital of the University of Pennsylvania. One year later he was promoted to visiting physician. During his early career, he also became a visiting physician at the Maternity Hospital, the Northern Home for Destitute Children, and Children’s Hospital of Philadelphia (founded 1855); this experience provided Starr with his education in pediatrics. In 1880 Starr began lecturing on the diseases of children in the University of Pennsylvania Medical School, and in 1884, when Penn created the position of clinical professor of diseases of children, Starr became Penn’s first professor of pediatrics. This development was part of the separation of the old field of midwifery into three separate professorships: obstetrics, gynecology, and pediatrics. Starr gave up his chair at the age of 41, supposedly because the wards of the Hospital of the University of Pennsylvania did not provide facilities for children, thus making it very difficult for him to include practical demonstrations in his teaching. After leaving Penn’s Medical School, Starr continued his private practice while also writing and lecturing on pediatrics. Starr was the author of various medical works including Diseases of Digestive System in Children, Hygiene of the Nursery, and The Adolescent Period. He also served as the American editor of Goodheart’s Diseases of Children. Starr was a member of many medical societies, including the American Pediatric Society, the Philadelphia College of Physicians, and the Association of American Physicians. Louis Starr married Mary Parrish in 1882. They had a daughter and two sons, one of whom died fighting in World War I. The family lived for many years on Locust Street, above 18th Street, in Philadelphia, but spent their summers at their home at Dark Harbor on Isleboro Island, Maine. In 1925 Louis Starr died in Duard, France, where he had lived for several years.